Smoothies are a great way to start the day. They are packed full of fruits and vegetables giving you a straight shot of vitamins and minerals in the morning to start your day. They give you a nice shock of energy to get started, while also containing complex carbohydrates to keep you fuller for longer throughout the day. However, there are ingredients that you should never put into a smoothie, as they do far more harm than good. It doesn’t matter whether it’s sugar or artificial sweetener, there is no need for this. Firstly, table sugar is terrible for you in every way, leading to Type 2 Diabetes. However, sweeteners are just as bad and have shown to have terrible effects on the liver. One of the main problems with smoothies anyway is the high level of natural sugar, so adding more sugar on top is unnecessarily indulgent. Enjoy the natural sweetness of the fruit, but try to balance it out with vegetables such as kale or broccoli. If you do want to increase the sweetness, add stevia, which is natural and calorie-free. If you want to get protein into your smoothie, add a natural source of protein such as nuts or natural yogurt. Adding protein powder usually dramatically increases the calories due to the high levels of sugar in these powders. Equally, protein powders are very high in protein and while consuming enough protein is beneficial, consuming too much protein isn’t good for you at all. It can wreak havoc with the kidneys and excess protein is usually stored as fat. Instead of this, try a scoop of natural peanut butter. When fruit is dried, the water is removed. This means that you need more to feel full. 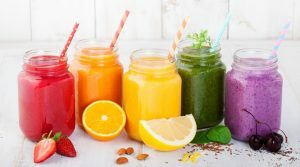 When the water is removed the sugar is highly concentrated, which means that adding this dried fruit to a smoothie, again increases the sugar dramatically. Moreover, a lot of dried fruit is dusted in sugar by the manufacturer in order to make it taste sweeter. Soy is not very good for the body in general. Soy protein is packed full of estrogen, which can cause problems with the thyroid and can cause infertility while increasing the risk of certain cancers. It is also produced using hexane, which is not great for your health. Soy protein is also largely produced as a GMO product and sprayed with a whole myriad of pesticides and herbicides. Low-fat yogurt always feels like it’s a better option for your health. However, you will find that in the process of removing the fat, a great deal of sugar is added to compensate, as the fat tends to hold all the flavor. Moreover, flavored yogurts have the same problems, especially if they are low-fat. These sugars may not appear as straight sugar, but sometimes take the form of even more damaging sweeteners like aspartame. 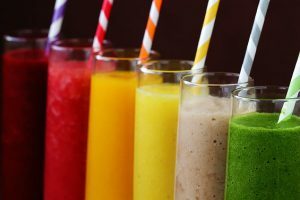 If you would like to boost your vitamin intake with your smoothie in the morning, you can consider adding a supplement. One of the best supplements to add its ‘Ultimate Man Once a Day’ as it includes all the relevant vitamins you need on a daily basis, including high levels of A and C, which need to be replenished daily as the body doesn’t store them. Pop one of these supplements into the blender with you smoothie every morning. When making smoothies, don’t forget the simple rule that you should have more vegetables than fruits in it if it is after lunch time. This helps to cut back on the sugar.